The Honda HRR216VYU is equipped with a huge 21" steel cutting deck, which is lightweight making it easy to manoeuvre in your own backyard. Fitted with blade brake technology means when you let go of the handle the blades stop but the engine keeps running, combining safety with convenience. The large 67 Litre catching bag allows you to spend more time mowing your lawn minimising the time you spend emptying that catcher unlike many competing models. The HRR216VYU is powered by a Honda Four-Stroke GCV160 overhead cm engine. Its efficient design allows for an easy starting, powerful but fuel efficient engine which is reliable and will be for many years. Honda's new auto choke feature also ensures that every time you pull your HRR216VYU out of the shed it will start first time every time saving you a lot of head aches. 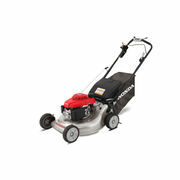 Honda has even taken the time to improve the smaller aspects of their mower on the HRR216VYU. With every wheel offering six heights for a more precise cut to your lawn, and the eight inch wheels equipped with rear ball bearings ensure your Honda drives smoothly. The HRR216VYU is also fitted with Hondas Smart Drive control letting you easily adjust the mowers speed allowing you to mow at your own pace. 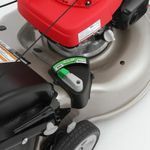 Mowing your lawn easily with the help if Honda's twin blade MicroCut system utilising four cutting surfaces and producing ultra fine clippings. 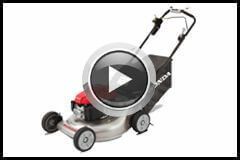 Ideal for the consumer who wants to mulch their grass revitalising their soil. All these features are topped off by Honda's simple three-in-one system controlled by the Clip Director. 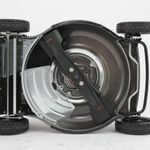 Allowing you to mulch, catch or simply discharge your clippings with the flick of a switch. 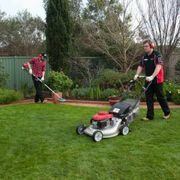 Meaning mowing your lawns was never easier! Honda's all new twin blade systems provides an efficient cut to your lawn cutting it into extra fine clippings when the mulching system is engaged. The clip director system allows you to change from mulching to catching just be flicking the clip, saving you time or the hassle from dealing with removing and inserting mulching plugs. This is arguably one of the best features on the mower. 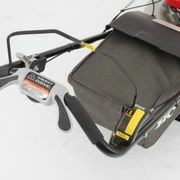 It combines safety with convenience as the blades stop when you release you hands from the handle but the engine keeps running. It does this by using a clutch system whereas the cheaper models simply turn the machine off when you release the handle meaning you must start the machine again.